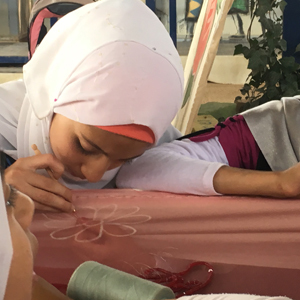 Since Helen's first visit to the Za'atari Refugee Camp in 2016, she has co created and delivered a number of projects with Syrian Women and girls. Through collaborative partnerships and informed by direct needs, they have together built upon existing talent and sought to foster increased opportunities for expert skills training, as well explore new creative approaches to enhance enterprise and education. In an age of reciprocity, these projects are as much about what Syrians have to teach us, as they are about us sharing knowledge, training and opportunity. Who: The female soap and perfume making community in camp, Givaudan Paris and Dubai, Deepa Patel, Helen Storey, UNHCR and IRD. Why: There is an urgent need for Syrians to become economically independent of NGO’s, something they long for and something that constant threats to funding requires. What: ‘4 Caravans’ is a project which brings together all we have learnt over the last 2 years. Beauty Coop will be a physical community and a dedicated space to operate and grow from in the future. Designed as an inspirational space with a Making Lab (created by Givaudan), for training and production of products, a Hydroponics Garden, in collaboration with Sheffield University, a crèche and a retail / gallery space, to sell produce to the camp and camp visitors. It will also serve a new social purpose amongst everyone who is a part of the community. Aim: To contribute to women’s ability to continue to up skill, remain dedicated mothers, create and sell beautiful products, create their own brands, explore sponsorship with Jordanian partners to sell outside of camp and to raise the level of money they can earn, seeking to lead to economic independence. Who: In collaboration with the fashion house of Elie Saab, The Tiger Girls, Tiger Coaches, Deepa Patel, Helen Storey and LCF International office, IRD, UNHCR. Why: The Tiger Girls speak often of their culture and lost heritage of Syria, both contemporary and before they were born. They have written poems of what this loss means to them, but still look to the future. The idea to bring their love of creativity, need for expression and another new skill lead to the thinking behind this project. What: We shared embroidery techniques that LCF students had also worked on and with Syria in mind wondered, if Syria was a stitch – a stitch which symbolised what it means to be Syrian now, what would it look like? Aim: To create a new Syrian stitch by learning a unique form of embroidery technique taught by expert hands from the House of Elie Saab and to share this skill on going by identifying the talented and gifted to pass it on after the project was delivered. Who: Helen Storey, Elizabeth McLafferty (LCF International), Lucy Wearing (Make Up artist and LCF Alumni), the ladies who attended the first basic training Short Course in camp and a second group of 18 female refugees who live in the surrounding urban area of Mafraq. Why: To give the women who have shown the most interest and creative promise, higher level skill sets, to aid their ability to offer makeup services within camp. UNHCR Jordan also made a request that LCF take the basic Short Course beyond the camp, to trial with the women who live in the local urban area of Mafraq. What: A 4 day course in camp, teaching in Advanced Make Up application and advice on skin care and skin health. Each woman was given a box with enough products and tools to last at least 1 year of their start up enterprises. This was gathered from a further ‘Make Up’ amnesty organised by Liz from world leading make up brands. Aim: To reach more women, who in turn, due to their own talents, could then spread the training to others when we are not in camp. To date LCF has trained 120 women and there is now a demand for training hair and nail care. Who: Helen Storey, MA Fashion Futures students. Why: A challenge back to students to respond to the real needs, both practical and social within the camp. What: MA students were invited to design spaces for the camp community. A number of ideas chimed with intended camp projects, Helen Storey, together with a team from Sheffield University (Science and Engineering), will try and realize some of the students ideas in real time and space. The ideas which lend themselves well to the development of informal community spaces, using the sun and wind to power utilities and create textile escapes for shade, as well as spaces for contemplation, play and conversation. Aim: to respond to the real needs of refugees in a live camp situation. Who: Helen Storey, the established soap & perfume making group of women at camp, Givaudan - Paris. Why: On one of Helen’s trips to camp, she met with a group of women already making good quality soap and perfume, but who welcomed working with Givaudan to share knowledge and create new making opportunities together. What: Helen met with Givaudan in Paris to share the inspirational story of the women makers in Za’atari. Givaudan instantly responded with a custom made workshop, sharing the science behind perfume making, creating a bespoke perfume with the women and exploring future collaborations together. Aim: To share and exchange knowledge and to explore a model to set up enterprises with commercial self sustaining opportunities within and beyond the camp. (other partners Oxfam, UNHCR, IRD and Unilever). Who: Helen Storey, Elizabeth Mclafferty (LCF), Lucy Wearing (Make Up Artist), a targeted group of women who have identified beauty as an area of interest and would like to set up enterprises. Why: To educate, develop skills, support development of enterprises. What: The team delivered a University of the Arts London accredited short course in beauty to 40 women (gifted by LCF Head of Collage Prof. Frances Corner). The participates received certificates and each received a make up kit created from gifted make up supplies, gathered during a UK make up amnesty, which raised £35,000 worth of product. Aim: Empowerment/re-building personal confidence, new skills, development of new enterprises. Who: Helen Storey, UNHCR, Oxfam, NRS international, IRD, TIGER Girls (These inspiring girls enjoy reading - 25 out of 1200), Jax Black (London College of Fashion technician), Saida Bruce (LCF International Team) & Deepa Patel. Why: The girls love of fashion, their wish for making skills, wish to be able to gift to others & fear of the winter. What: Day 1 included a workshop exploring the girls own imaginations and sense of self. On Day 2 the girls cut the basic shape of a coat and then using second hand clothes, gifted by Oxfam, and trimmings, gifted by The Cloth House and Barnet Lawson, decorated their coats based on day 1’s exploration. NRS International gifted the thermal fleece to make the coats. Aim: Learning new skills through team work and then sharing them with others, to promote a culture of upcycling, develop creativity and imagination, to build stronger connections to the girls peers and give back to the community through the process of gifting the coats.